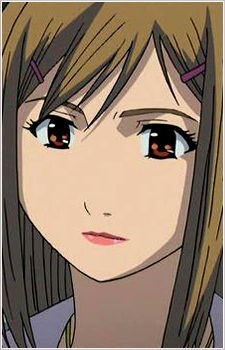 A recurring character, Miwa is sometimes a customer, sometimes a narrator. Miwa initially comes to Eden Hall to ask Ryū to define what spirit was contained within a bottle she broke during her childhood. Miwa, when she was little, was shown to be the only child of the family. Her father decided one day, that he'd propose to Miwa's grandfather to change the inn that he has been running into a fully-comfortable hotel-like bar, due to the change in era and customer's requests. However, Miwa's grandfather was hesitant, and decided not to take in his son's proposal. They later became apart and distant from each other, until the day came when Miwa's father called her grandfather and asked him to taste a special drink that he would like to present to him. On that fateful day that Miwa broke the glass as she gripped the bottle and ran towards her grandfather. She tripped and the bottle, which was encased in a bag, broke and its contents spilled. Miwa felt guilty as she thought if only they had the drink together, her father and grandfather wouldn't be apart like they used to. Not long after that, Miwa's parents were killed in a car accident, and this has halted her chance of ever finding out the name of that special drink. After much discussion with Ryū, the mystery of the drink was solved, and Miwa had the chance to finally allow her grandfather to have a taste. The drink was Suntory's Kakubin (referred to in the show as "Kaku"), and shortly after this episode, Miwa appears almost in every other episode as a side or minor character, and she usually narrates part of the story. She has been known to be a regular visitor at Eden Hall, and has invited one of her friends to the bar. In episode 7, Miwa takes care of Ryū after he has fallen sick, although she was unable to fetch a doctor. In the manga version of Bartender, Miwa works for Kamishima, the first customer featured in the anime.